The problem with ASLR is that it is useless to overwrite the return address with a fixed address. The idea of ret2ret is to return to an already existing pointer that points into the shellcode. Already existing pointers must contain valid stack addresses to work. These valid stack addresses are potential pointers to the shellcode. The attacker does not know anything about the stack addresses, but that does not matter, because he overwrites the instruction pointer by the content of such a potential shellcode pointer. to ... to the pointer (see figure 16). have to recall what a return does: A return means pop eip, i.e. the content of the location where the ESP points to is written to the EIP. Usually this content is the RIP, when ret is called. Furthermore the ESP jumps one location upwards (the stack shrinks). Imagine the RIP location contains a pointer to a ret command itself, and the location above as well and so on. This would end in a chain of returns: ret2ret.Remember that the addresses of the code segment are not randomized. A ret command can be found in the code segment of every program. So it is no problem to fill the stack with reliable pointers to return commands. The return chain should end right before the potential shellcode pointer, which would be called by the last ret. So the number of returns is variable, based on the offset from the return instruction pointer to the potential shellcode pointer.The potential shellcode pointer must be placed above(that means before) the first RIP, i.e. the pointer has to be older than the vulnerable buffer. But where to find pointers to newer stack frames? Every string and therefore most buffer overflows have to be terminated by a zero byte. 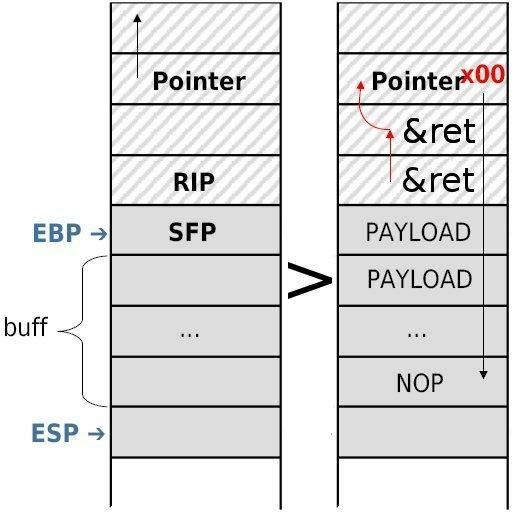 Thus the least significant byte of the potential shellcode pointer can be overwritten with a zero.Due to this zero byte the pointer may be smaller than before and from there on it points to newer stack contents - where the shellcode is placed (see figure 16). This byte alignment only works on a little endian system and a downwards growing stack. Who wants to try this on Sun SPARC? I said it works ”often”, because the address space is randomized by every instantiation and so there will be always a remaining risk, that the shellcode pointer do not lead to its goal (after the byte alignment).